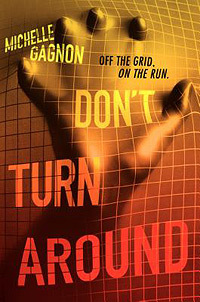 I just finished reading Don't Turn Around by Michelle Gagnon. (The paperback comes out next month, by the way.) I was only a few pages in when I thought, Wow, this character, Noa Torson, has a Girl with the Dragon Tattoo vibe. We're talking a seriously computer literate young girl character living on her own who even has a Scandinavian name. (I think we're told it's Danish, while Lisbeth Salander is Swedish.) Clearly making that connection was not a novel idea on my part. Gagnon's website describes the book as "A technothriller: GIRL WITH THE DRAGON TATOO for Teens." I actually liked this book better than Dragon Tattoo, which I didn't finish because it seemed very bloated and dragged. (I saw all the Swedish movies made from the trilogy, just to keep me in the loop.) I did think the point of view switches between Noa, who, when we first meet her has just woken up on some kind of gurney and has what sounds like a pressure bandage on her chest, and Peter, whose home is invaded during his introduction by men in black types who appear to know his parents and take his laptop, slowed things down a bit. I also wasn't crazy about suddenly bringing in a third point of view around the halfway point. I think it's also around the halfway point that we come to realize that this isn't just a thriller. It now also has what could be described a science fiction angle. I will admit, however, that that these points are all author talk. General readers probably aren't going to obsess about the kinds of things I obsess about. For general readers, this is a book that is not a fantasy, not a mean girls story, not a romance. It's a plot driven adventure/thriller/mystery with some scifi thrown in that's set in real world Boston. I'm sure there are teenagers who would be relieved to get their hands on this. It's the first book in a trilogy, of course. An interesting point, I think: Michelle Gagnon is the author of four adult thrillers. Don't Turn Around was her first book for YAs. It reminded me of Au Revoir, Crazy European Chick by Joe Schreiber. That was Schreiber's first book for YAs after having begun his career writing horror and Star Wars novels. We're talking another teen thriller. Both books could easily have been written for the adult readers the authors usually write for by simply adding a decade to the main characters' ages. Another similar book is I Hunt Killers by Barry Lyga. Lyga isn't an adult genre writer turning to YA. He's always been a YA author. But I Hunt Killers has that same kind of adult thriller reworked for teenagers feeling to it. We're talking a Dexter-type of story, with a Dexter character as a teenager, before he goes off the rails and gives in to blood lust. Which adult books could we see in YA next? What's A Self-Publishing Author To Do? Did You Read "The Casual Vacancy?" Why Am I Not Good Enough?